All right, so here we are in front of the elephants, the cool thing about these guys is that they have really, really, really long trunks, and that's, that's cool. And that's pretty much all there is to say. ↑ हार्ट्ली, मैट (February 19, 2010). "Ten of YouTube's most influential videos". कैनवेस्ट. ↑ McGuinness, Ross (April 15, 2010). "Elephants to Gaga". Metro: পৃষ্ঠা 34. "IT began with a spectacularly ordinary 19-second clip of man at the zoo, watching some elephants... It has been viewed almost 2million times." ↑ Meltzer, Tom; Phillips, Sarah (October 23, 2009). "G2: A First Time For Everything". द गार्ज़ियन (लंदन): পৃষ্ঠা 14. ""Me at the zoo" is a man called Karim's 19-second long report from the elephant enclosure at San Diego zoo... But its historical significance means that it has had well over a million hits so far." ↑ "jawed - YouTube". https://www.youtube.com/user/jawed/about। আহৰণ কৰা হৈছে: 2015-04-25. "Joined 23 Apr 2005"
↑ Hoby, Hermione; Tom Lamont (April 11, 2011). "How YouTube made superstars out of everyday people". The Observer (किंग्स प्लेस, लंदन, इंग्लैंड, यूके: गार्ज़ियन मीडिया ग्रुप). ISSN 0029-7712. OCLC 50230244. Archived from the original on May 1, 2011. http://www.webcitation.org/5yMwWYKJU। আহৰণ কৰা হৈছে: May 1, 2011. "A girl in red hotpants helped elect a US president, a British pensioner became everyone's favourite grandad. In just five years, the YouTube website has invented a new kind of celebrity"
↑ Heffernan, Virginia (September 6, 2009). "Uploading the Avant-Garde". The New York Times. http://www.nytimes.com/2009/09/06/magazine/06FOB-medium-t.html। আহৰণ কৰা হৈছে: April 4, 2011. "The ﬁrst video on YouTube was uploaded at 8:27 p.m. on Saturday, April 23, 2005. 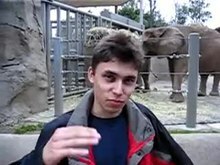 It’s called “Me at the Zoo,” and it features the musings of Jawed Karim, one of the site’s founders, as elephants nose around in hay behind him."